The well known black sand beaches sweeping down the west coast of the North Island are the sites of New Zealand’s greatest known reserves of ironsand. Its potential for commercial use was recognised from the early days of European settlement. This black ironsand was formed 2.5 million years ago from rock deposited on the coast by volcanic activity in the Taranaki region. The sand contains mainly ironsand (titanomagnetite) and lime-soda feldspars. Over the centuries, the heavy dark ironsands have been transported by ocean currents along the coast and deposited on beaches, forming dunes of up to 90 metres high. After extensive trials, the New Zealand Steel Mill at Glenbrook opened in 1970 with an ironsand mine located at the mouth of the Waikato River. The company also has a mining site at Taharoa, 150km south of Auckland and a few kilometres south of Kawhia Harbour. This ironsand deposit covers 1,600 hectares making it the largest in New Zealand. The ironsand from Taharoa is exported to Japan, South Korea and China, where it is used to assist in prolonging the life of the brick lining in blast furnaces. At Waikato North Head mine, each day up to 40,000 tonnes of fresh water is extracted from the Waikato River. About 7,000 tonnes is used to transport ironsand as a slurry to the Glenbrook site and the remainder is used for the mining and concentration of ironsand. At Taharoa, only about 4,000 tonnes of fresh water each day is added to the water system for the mining and concentration operation. When a ship is loaded with ironsand up to 60,000 tonnes of water a day is used. Since 1970 the mining operations have increased their recycling of water, thereby reducing water discharge. They have also increased the use of stormwater, reducing the volume of water extracted. One possible result of water extraction is the uptake of fish, particularly juveniles. To avoid this, at Waikato North Head mine, the water intake is set well off the main river flow, where fish tend not to swim. Water flows slowly down a wide artificial channel to the intake and when the gates to the reservoir are open the fine mesh screens stop even juvenile fish getting through. At Taharoa, the Wainui Stream, fed by Lake Taharoa, was dammed to allow water extraction. So that fish could continue to migrate from the sea to the lakes past the artificial dam, a fish ladder was installed. Fish are diverted from the dam by a weir and swim up the "ladder" - a concrete box section with running water and partitioned to create eddies and ponds. Many improvements have been made to the fish ladder to make the bypass more suitable for all fish species. Surveys of fish numbers are conducted regularly by staff, to assess if there is any decline in fish numbers using the ladder. For the Waikato North Head mining operation, water is extracted from the lower Waikato River in an area that is strongly influenced by tides. This means that the overall effect on the river flows and the hydrology of the river is negligible. Eighty seven percent of the water extracted is returned to the river by various means, reducing the effect of extracting water. Once the slurry reaches the buoy it is pumped through floating hoses into the ship. Pioneered by New Zealand Steel, the system loads vessels at sea without the need for normal port facilities, which would have had a significant environmental effect for this remote location. At the Waikato North Head mine, 1.4 million tonnes of ironsand concentrate is transported to Glenbrook each year through an 18km electric powered underground slurry pipeline, a New Zealand Steel innovation and a world first. Several alternatives for transporting the ironsand concentrate were considered prior to the slurry pipeline's development. Road transport was rejected because of high energy requirements, noise, safety for other road users and dust problems. Alternatives such as rail, ropeway and a combination of river barges and road transport were investigated and rejected. The pipeline was the method with the least adverse effect on the environment. It is unobtrusive and does not affect farmland, the community or the environment along the route. Each year 1.2 to 1.4 million tonnes of ironsand is needed to produce steel at Glenbrook. 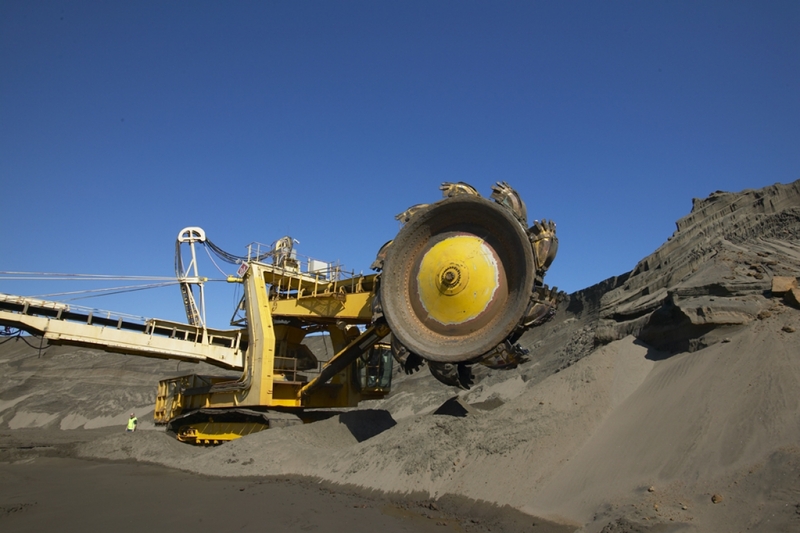 To obtain this, 4 to 7 million tonnes of sand needs to be mined at the Waikato North Head site. At the Taharoa mine site around 1 million tonnes of ironsand is extracted for export each year. Once the sand is mined, the titanomagnetite is separated from the sand by magnetic and gravity separation processes. No chemicals or other additives are used. The unwanted material, or tailings, is returned to the mined areas to help return it to its original form. Tailings deposit areas are contoured to recreate the original land forms. Marram grass and radiata pine trees are planted to stabilise deposits and minimise wind-blown sand. The tailings consist of river water containing clays and sands. These are all natural materials derived from the area and as such do not adversely affect the dune environment. To transport ironsand from the mine sites, water is mixed with ironsand to form a slurry (50-50 ratio). At Taharoa the slurry is pumped through two parallel pipelines to a buoy moored three kilometres off shore.